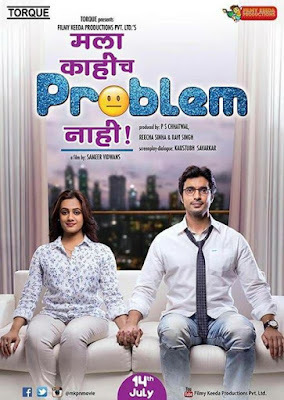 "Mala Kahich Problem Nahi (मला काहीच प्रॉब्लेम नाही)" is an upcoming movie in which we will be seeing a fresh new pairing of Actress, poet, lyricist "Spruha Joshi " and actor "Gashmeer Mahajani" this is the first time these both actors will be working together, it will be interesting to watch them on silver screen. The movie is directed by talented director "Sameer Vidwans" who has given back to back hits like "Time Please", "Double Seat" and "YZ" common thing between all these movie was all were entertaining and in all these three films the lead pair were paired first time opposite each other. Even in this film Vidwans has done same thing. The movie is produce by produce by P S Chhatwal, Reecha Sinha and Ravi Singh under banner "Filmy Keeda Productions Pvt. Ltd." it will be presented by "Torque". The movie will be releasing in cinema on 28th July 2017.